Want a bigger high-cap version of the same gun? Simply install the 13-round magazine with Mag X-Tension and you've got a short-barreled gun with a full-size grip. It was only a matter of time. The popular Springfield Armory XD(M) 3.8 Compact is now available in .45 ACP—but that's not the best part. 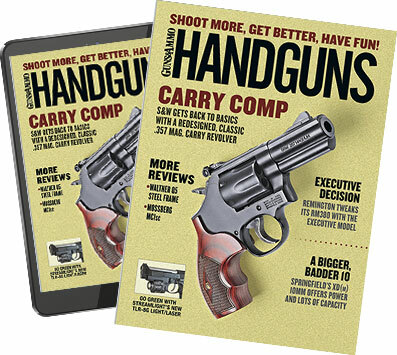 By buying just one gun, you can have your choice of a 9+1 concealed carry gun that's just 27 ounces and with a height of just 4.55 inches or more of a full-size 13+1 pistol, just by using a convenient Mag X-tension. With Mag X-tension installed the gun weighs 29 ounces; OAL in both configurations is seven inches. The gun comes with both the 9- and 13-round mags and the X-Tension. The fully ramped barrel is finished in Melonite. The three-dot sights are steel. The polymer frame gun is available with forged steel black slide and polymer frame for $732 or bi-tone (stainless slide, black frame) for $797. The XD(M) Compact 3.8 .45 comes with carrying case, two stainless steel Megazines, mag loader, double mag pouch, three interchangeable backstraps and three X-Tensions. We hope to get our hands on one of these as soon as possible for test, so stay tuned.